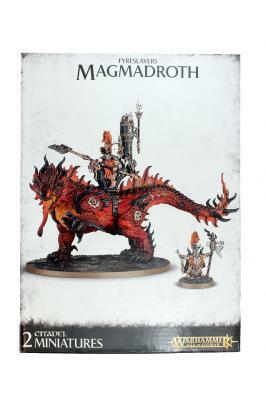 Mighty Fyreslayer heroes lead the charge in to battle, riding on the burning backs of colossal monstrous Magnadroths. Beasts that live and thrive in the Lava Rivers within the deep earth. Huge scaled and horned monsters with fire flickering out across their backs and out of their razor toothed jaws and tongues. With magical ur-gold runes stamped in to their scales for strength and protection, these hulking creatures will make any foe cower in fear.